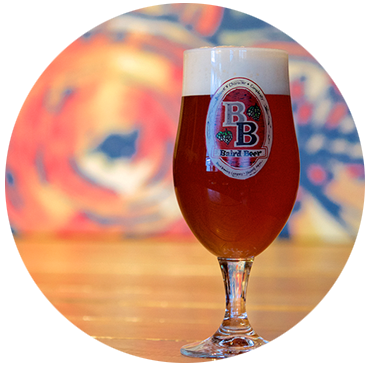 This effervescent yet stealthily strong fruited Ale is defined by the succulent aroma and piquant flavor of sweet-tart mikan fruit and its wonderfully symbiotic interaction with our selected citrus-accented hop varieties. Japanese daiku (carpenter) remain today symbols of Japan’s long history of skilled craftsmanship. The kanji for daiku read: 大工. These kanji are carved into the mountain in front of which is depicted the terraced fields and orchards of the Heda countryside where our daiku grows mikan fruit on his family’s ancestral land. 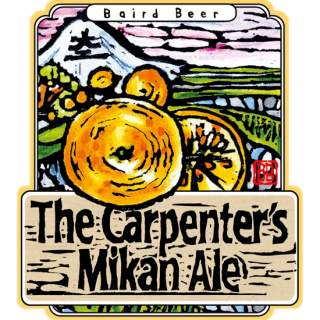 The Carpenter’s Mikan Ale was the very first fruited beer I ever brewed. As a 1990s trained brewer I was deeply cynical about fruited beers, most at the time being extract-infused gimmicks trying to appeal to non-beer drinkers. That all changed when our carpenter, Nagakura-san, brought in a big basket-full of freshly picked mikan fruit from his orchard. Using a fresh, local, natural ingredient (as opposed to a processed extract) fit perfectly into my brewing philosophy. I debuted the first 30-liter batch of Carpenter’s Mikan Ale to a small group of customer-friends gathered at the Numazu Fishmarket Taproom in the early hours of a cold February morning in 2002. We were there to watch live the American football Super Bowl. Well, long story short, the keg was all but kicked by the end of the game. I knew we were on to something and that fresh in-season whole fruit would assume an important position in Baird Beer’s ingredient arsenal.